Joe's distorted romanticism has him constantly attempting to squeeze his love interests between the pages of his classic literature, and when he eventually tires of trying to fit a square peg into a round hole, he loses it. But people don’t want to face that possibility. Nor do we want to confront our own complicity, when we look away, in the actions of rapists and abusers. We want everything to be nice. La Razón (Spain) interviews Gloria Fortún who, among many other things, has just translated Joanna Russ's How to Suppress Women's Writing. View from the Cheap Seat reviews Danielle Pearson's stage adaptation of Jane Eyre, giving it only 2 stars out of 5. Weekly Standard features The Writer’s Map. An Atlas of Imaginary Lands, edited by Huw Lewis-Jones and mentions - and shows - one of Branwell's imaginary maps. 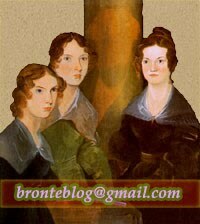 Finally, 'The Death, Will and Burial of Aunt Branwell' on AnneBrontë.org.